The Virtue of Slow Software: Fewer Fads in Schools? With the above paragraph, journalist Clive Thompson opens his article on “Slow Software” in Wired magazine. His argument is straight-forward: devices speed up our lives, encourage impulsivity, and buyer’s remorse. For the above example of excessive buying–which, of course, is crucial to the economy which depends upon Americans shopping–Thompson describes a piece of software that slows the shopper down. [A team of software designers] created Icebox, a Chrome plug-­in that replaces the Buy button on 20 well-known e-commerce sites with a blue button labeled “Put it on ice.” Hit it and your item goes into a queue, and a week or so later Icebox asks if you still want to buy it. In essence, it forces you to stop and ponder, “Do I really need this widget?” Odds are you don’t. It’s a Sisyphean battle, I admit. Offered the choice, we nearly always opt for convenience…. Icebox is brilliant but hasn’t yet taken off. Socratic deliberation improves our lives—but, man, what a pain! Slow software reminded me of what Steve Arnett reported in an earlier post. Ninety-eight percent of the software that school administrators purchased for classroom use was not used intensively (at least 10 hours between assessments)–yes, 98 percent. All of this got me thinking anew about who makes district decisions about buying software for classrooms and the muting of teacher voices when it comes to these district office decisions–which, of course, have to ultimately be approved by boards of education. School leaders need slow software before going on buying sprees of teaching and learning software peddled by companies. Impulsive shopping–see opening paragraph above–hits school leaders as it does the typical consumer surfing Amazon or similar sites. This impulse buying is the way that fads get started (hype transforms fads into “innovations”). Of course, district officials who spend the money do not need software to slow their decisions down for a week that Icebox proposes. Instead of slow software, they can use some old-fashioned, analog ways of decision-making that bring teachers into the decision cycle at the very beginning with teachers volunteering to try out the new software (and devices) in lessons, administrators collecting data, and analysis of data by mix of a teachers and administrators. And I do not mean token representation on committees already geared to decide on software and devices. With actual groups of teachers using software (and devices) with students, then a more deliberate, considered, and informed decision can be made on which software (or devices) should get licensed for district. Of course, this suggestion means that those who make decisions have to take time to collaborate with those who are the objects of those decisions before any district money can be spent. And time is a scarce resource especially for teachers. Not to be squandered, but there are tech-savvy teachers who would relish such an opportunity. My hunch is that there are cadres of teachers who do want to be involved in classroom use of software before they are bought and would appreciate the chance to chime in with their experiences using the software in lessons. Teacher validation of an innovation aimed at teaching and learning can not be sold or bought without teachers using the software in lessons. As Thompson points out it is a struggle to restrain impulsivity when buying stuff because “[o]ffered the choice, we nearly always opt for convenience.” That applies to district leaders buying software for teachers to use in their lessons. And faddishness is the last thing that schools need when budgets are tight and entrenchment is in the air. A Fad Dissolver period declared at the onset of a classroom trial that runs three-to-six months to determine how valid and useful the software is could halt the impulse buying that so characterizes districts wanting to show how tech savvy they are and avoid the common practice of storing in drawers and closets unused software and devices. 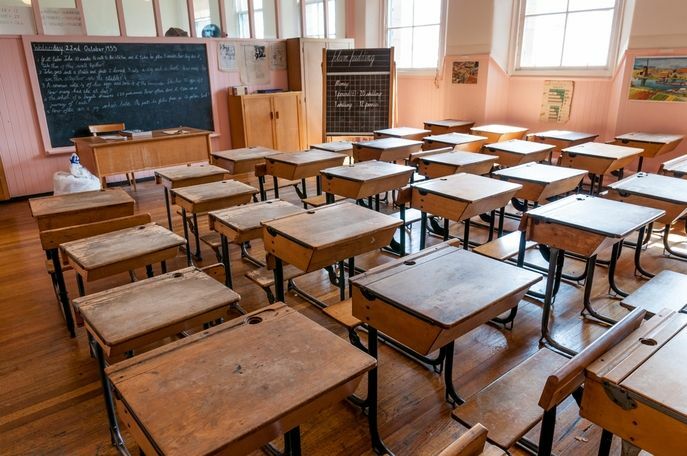 A friend and former colleague, Henry Levin, recently wrote about his experience in a 1940s classroom. I started school in 1943, and by the time we were in third grade we were introduced to writing cursive using an ink pen. Initially these were the pens with long tapered wooden handles with replaceable pen tips or nibs, but by sixth grade we were expected to use fountain pens because they were less messy. I remember filling carefully my pen by maneuvering a lever on its side that compressed a rubber bladder inside to draw ink from the inkwell on its release. I was also given the responsibility of refilling the inkwells each day or every other day. We used huge bottles of Quink (perhaps a liter), and they had to be manipulated in just the right way to fill (three quarters), but not overfill the inkwell. My recollection is that this was a permanent ink that could not be removed from my clothing. Once I dropped the entire bottle on the floor, leading to a large spill. That required initially placing newsprint and paper tissues to soak up most of it, followed by a mopping and scrubbing with water and suds. Still, a shadow of the ink remained, and the teacher reminded me periodically that I needed to be careful not to further damage her floor. Towards the end of high school some very expensive ballpoint pens began to replace the ink pens, and we were no longer expected to use the ink paraphernalia.But, the old desks last for a long time. Even in the late fifties (I was in college), I visited my old high school and found that all of the student desks still had inkwells. Students wondered what they were for. I also have a memory of a later technology that, like the inkwell, became obsolescent. In the late 1960s Stanford University administrators secured federal funds to build a multi-million dollar facility called the Stanford Center for Research, Development, and Teaching (SCRDT). A fully furnished television studio with “state-of-the-art” cameras, videotape recorders, and monitors occupied the main floor with the star-in-the-crown of the new building located in the Large-Group Instruction room (LGI). The amphitheater-shaped room with half-circular rows looked down on a small stage with a lectern, a massive pull-down screen, and 2 large monitors suspended from the ceiling. At most of the individual seats was a small punch-button pad called the “student responder.” The responder contained the numbers 1-10 and letters T and F.
At the very top of the amphitheater was a glass-enclosed technician’s station where an aide could assist the professor with amplification of sound, simultaneous interpretation of various languages, show slides or films, and put on monitors data that the professors wanted. 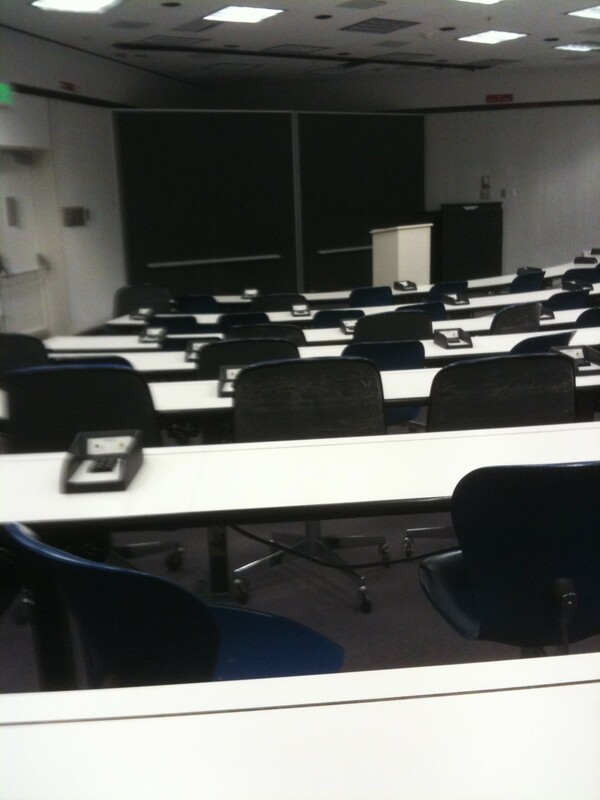 Administrators had designed the room for professors to enhance the delivery of lectures. For lectures, the student responder came into play. 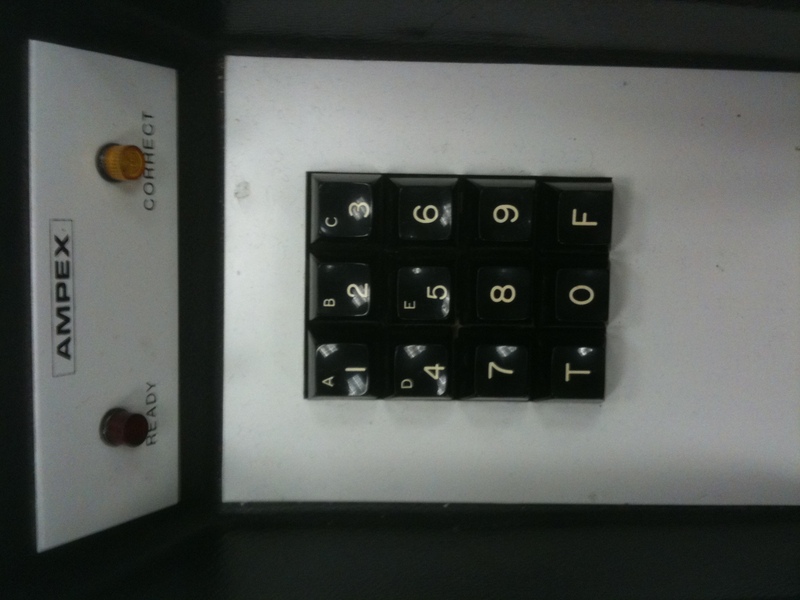 Designers created the pad for students to punch in their choices to communicate instantaneously to the lecturer their answers to the professor’s questions, such as “If you agree, press 1, disagree, press 2.” “If statement is true, press T.” As students pressed the keypad, the data went directly to a mainframe computer where the students’ responses were immediately assembled and displayed for the professor at a console on the lectern. The lecturer was then able to adjust the pace and content of the lecture to this advanced interactive technology, circa 1970, that linked students to teacher. In 1981, when I returned to teach at Stanford, the SCRDT had been renamed the Center for Educational Research at Stanford (CERAS). In the LGI, none of the original equipment or technology (except the sound system and simultaneous translation) was used by either students or professors. The student responders, however, were still there. By 2011, nearly a half-century after the SCRDT installed the LGI, the amphitheater room was still in use as a regular lecture hall. I was in that room that year to hear a colleague talk about his career in education and, you guessed it, as I listened, my fingers crept over to the “student responder” and I began to click the keys. Whoever said classrooms don’t change? *Thanks to Deborah Belanger for supplying the date of the LGI renovation. Nicholas Carr is an author who has written extensively on information technology (IT) for the past 15 years. His 2010 book The Shallows was a finalist for the Pulitzer Prize. I include this recent essay of his because nearly all readers of this blog and I have experienced “bugs” in the software we use daily. He tells the story of an IT phrase that has entered our idiom and become a cliche. A standard joke is that a bug can be turned into a feature simply by documenting it (then theoretically no one can complain about it because it’s in the manual), or even by simply declaring it to be good. “That’s not a bug, that’s a feature!” is a common catchphrase. When 19th-century inventors and engineers started using bug as a synonym for defect, they were talking about mechanical ­malfunctions, and mechanical malfunctions were always bad. The idea that a bug might actually be something desirable would never have crossed the mind of an Edison or a Tesla. It was only after the word entered the vocabulary of coders that it got slippery. It’s not a bug, it’s a feature is an acknowledgment, half comic, half tragic, of the ambiguity that has always haunted computer programming. In the popular imagination, apps and other programs are “algorithms,” sequences of clear-cut instructions that march forward with the precision of a drill sergeant. But while software may be logical, it’s rarely pristine. A program is a social artifact. It emerges through negotiation and compromise, a product of subjective judgments and shifting assumptions. As soon as it gets into the hands of users, a whole new set of expectations comes into play. What seems an irritating defect to a particular user—a hair-trigger ­toggle between landscape and portrait mode, say—may, in the eyes of the programmer, be a specification expertly executed. INABIAF—the initialism has earned a place in the venerable Acronym Finder—is for programmers as much a cri de coeur as an excuse. For the rest of us, the saying has taken on a sinister tone. It wasn’t long ago that we found software ­dazzling, all magic and light. But our perception of the programmer’s art has darkened. The friendly-seeming apps and chatbots on our phones can, we’ve learned, harbor ill intentions. They can manipulate us or violate our trust or make us act like jerks. It’s the features now that turn out to be bugs. The flexibility of the term bug pretty much guaranteed that INABIAF would burrow its way into everyday speech. As the public flocked online during the 1990s, the phrase began popping up in mainstream media—The New York Times in 1992, The New Yorker in 1997, Time in 1998—but it wasn’t until this century that it really began to proliferate. A quick scan of Google News reveals that, over the course of a single month earlier this year, It’s not a bug, it’s a feature appeared 146 times. Among the bugs said to be features were the decline of trade unions, the wilting of cut flowers, economic meltdowns, the gratuitousness of Deadpool 2’s post-credits scenes, monomania, the sloppiness of Neil Young and Crazy Horse, marijuana-induced memory loss, and the apocalypse. Given the right cliché, nothing is unredeemable. The programmer’s “common catchphrase” has itself become a bug, so trite that it cheapens everything it touches. But scrub away the tarnish of overuse and you’ll discover a truth that’s been there the whole time. What is evolution but a process by which glitches in genetic code come to be revealed as prized biological functions? Each of us is an accumulation of bugs that turned out to be features, a walking embodiment of INABIAF. “Personalized learning”–and whatever it means–has been the mantra for policymakers. technology entrepreneurs, and engaged practitioners for the past few years. Mention the phrase and those whose bent is to alter schooling nod in assent as to its apparent value in teaching and learning. Mentions of it cascade through media and research reports as if it is the epitome of the finest policy to install in classrooms. But it is not a policy, “personalized learning” is a strategy. A strategy, in politics, can be confused with a policy or a vision, but they’re not quite the same thing. Policies address the “what”; they’re prescriptions for the way things might operate in an ideal world. Strategy is about the “how.” How do you move toward a desired end, despite limited means and huge obstacles? We tend to associate strategy with high-level decision makers — generals, presidents, corporate titans — but the basic challenge of, in [Saul] Alinsky’s words, “doing what you can with what you have” applies just as much when working from the bottom up. While the two are connected, making the distinction between policy and strategy is essential to not only political leaders but military ones as well. Strategies are instruments to achieve policy goals so, for example, in the 17 year-old war in Afghanistan, ambiguous and changing U.S. goals—get rid of Taliban, make Afghanistan democratic, establish an effective Afghan military and police force–influenced greatly what strategies U.S. presidents–three since 2001–have used such as sending special forces, army, and marines into the country—frontal assaults on Taliban strongholds, counter-insurgency, etc. (see here and here). Without recognizing this distinction between policy and strategy military and political leaders behave as blind-folded leaders taking one action while devising another plan to implement to achieve ever-changing goals. Photo illustration by Derek Brahney. Source image of painting: Bridgeman Images. Also keep in mind that public schools are political institutions. Taxpayers fund them. Voters elect boards of education to make policies consistent with the wishes of those who put them into office. And those policies are value-driven, that is, the policy goals school boards and superintendents pursue in districts, principals in schools, and lessons teachers teach contains community and national values or, as Gage put it above: prescriptions for the way things might operate in an ideal world. Of course, these value-laden goals, e.g., build citizens, strengthen students’ moral character, insure children’s well being, prepare graduates for jobs, can be contested and, again become political as tax levies and referenda on bilingual or English only instruction get voted up or down. So policies do differ from strategies in schooling. The distinction becomes important particularly when it comes to media-enhanced school reforms. In light of this distinction, consider “personalized learning.” When I ask the question of teachers, principals, superintendents and members of school boards about”personalized learning”: toward what ends? I get stares and then answers that are all over the landscape–higher test scores, reducing achievement gap between minorities and whites, getting better jobs and motivating students to lifelong learning (see here). The question is essential because entrepreneurs, advocates, and promoters pushing “personalized learning” expect practitioners to reorganize time and space in schools, secure new talent, buy extensive hardware and software, shift from teacher-centered to student-centered instruction, and provide scads of professional development to those putting what has now become a policy into practice. The fact is that “personalized learning” is not a policy; it is a strategy. What has happened here as it has in politics and the military is that a “strategy” has become the desired end replacing the initial policy goal. Leaders forget that a policy is a “what,” a prescription for the way things might operate better than they do, a solution to a problem, not a “how” do you move toward a desired end, despite limited means and huge obstacles? While this switch from policy-to-strategy is common it is self-defeating (and consequential) in an organization aiming to help children and youth live in the here and now while getting ready for an uncertain future. We want to make sure that [PL], which seems like a good hypothesis and approach, gets a good shot at getting tested and implemented. Personalized learning is rooted in the expectation that students should progress through content based on demonstrated learning instead of seat time. By contrast, standards-based accountability centers its ideas about what students should know, and when, on grade-level expectations and pacing. The result is that as personalized learning models become more widespread, practitioners are increasingly encountering tensions between personalized learning and state and federal accountability structures. Individuals: Companies like Apple and Amazon want you to pay them directly for their products, or for the products that others sell in their store. (Although Amazon’s Web Services exist to serve that Big Business market, above.) This is one of the most straightforward business models—you know exactly what you’re getting when you buy an iPhone or a Kindle, or when you subscribe to Spotify, and because it doesn’t rely on advertising or cede purchasing control to your employer, companies with this model tend to be the ones where individual people have the most power. EdSurge asked me to offer reflections and predictions for 2017. The following appeared in EdSurge, December 27, 2017. As someone who has taught high school history, led a school district, and researched the history of school reform including the use of new technologies in classrooms over the past half-century, except for one event noted below, I found little that startled me in 2017. For digital tools in classrooms, it was the same o’ same o’. Sure, I am an oldster and have seen a lot of school reform both successes and failures but I am neither a pessimist nor a nay-sayer about public schools. I am a tempered idealist who is cautiously optimistic about what U.S. public schools have done and still can do for children, the community, and the nation. Both the idealism and optimism—keep in mind the adjectives I used to modify the nouns—have a lot to do with what I have learned over the decades about school reform especially when it comes to technology. So for 2017, I offer no lessons that will shock but ones distilled from my experience. When it comes to student use of classroom technologies, talk and action are both important. Differentiating between the two is crucial. Anyone interested in improving schooling through digital tools has to distinguish between media surges of hyped news about, say, personalized learning transforming schools and virtual reality devices in classrooms from actual policies that are adopted (e.g., standards, testing, and accountability, buying 1:1). Then one has to further distinguish between the hyperbole and adopted policies and programs before determining what teachers actually do in their classroom lessons. The process is the same as parsing hyped ads from the unwrapped product in your hand. These distinctions are crucial in making sense of what teachers do once the classroom door closes. Access to digital tools is not the same as what happens in daily classroom activities. District purchases of hardware and software continue to go up. In 1984, there were 125 students for each computer; now the ratio is around 3:1 and in many places 1:1. Nothing startling here—the trend line in buying stuff began to go up in the early years of this century and that trend continues. Because this nearly ubiquitous access to new technologies has spread across urban, suburban, exurban, and rural school districts, too many pundits and promoters leap to the conclusion that all teachers integrate these digital tools into daily practice seamlessly. While surely the use of devices and software has gained full entry into classrooms, anyone who regularly visits classrooms sees the wild variation in lessons among teachers using digital technologies. Yes, teachers have surely incorporated digital tools into daily practice but—there is always a “but”—even those who have thoroughly integrated new technologies into their lessons reveal both change and stability in their teaching. In 2016, I visited 41 elementary and secondary teachers in Silicon Valley who had a reputation for integrating technology into their daily lessons. They were hard working, sharp teachers who used digital tools as familiarly as paper and pencil. Devices and software were in the background, not foreground. The lessons they taught were expertly arranged with a variety of student activities. These teachers had, indeed, made changes in creating playlists for students, pursuing problem-based units, and organizing the administrative tasks of teaching. But I saw no fundamental or startling changes in the usual flow of lessons—setting goals, designing varied activities and groupings, eliciting student participation, assessing student understanding— that differed from earlier generations of experienced teachers. The lessons I observed were teacher-directed and post-observation interviews revealed continuity in how teachers have taught for decades. Again, stability and change in teaching with digital tools. Oh yes, there was one event that did startle me. That was the election of Donald Trump as President. I do not believe that his tenure in the White House or that of his Secretary of Education will alter the nation’s direction in schooling–my first prediction. Every Student Succeeds Act (2016) shifts policymaking from federal to state offices. Sure, there is much talk in D.C. about more choice, charters, and vouchers but much of it remains talk. Little change in what schools do or what happens in classrooms will occur. What is disturbing is the President’s disregard for being informed, making judgments based on whim, tweeting racist statements, and telling lies (Politifact has documented 325 Trump statements that it judges mostly or entirely false) . These Presidential actions in less than a year have already shaped a popular culture where “fake news,” “truthful hyperbole,” and “post-truth” are often used phrases. Indirectly, the election of Donald Trump—and here is my second prediction—will spark a renaissance in districts and schools working on critical thinking skills and teachers and students parsing mainstream and social media for accuracy. Maybe the next generation will respect facts, think more logically, be clearer thinkers, and more intellectually curious than our current President. I am fortunate to have many readers who are classroom teachers. I have published posts over the past year about my research on teachers identified as exemplary in integrating technology into their lessons. Some of those posts triggered responses from teachers. I offer a few of those comments here. ….The impact of technology can vary greatly depending on the subject matter (among all the other things you’ve addressed). While some pedagogical practices are universal, when “doing the work of the discipline”, content-specific practices,and by extension the impact of technology, might vary widely. I mention this to say that as someone who lived through the IT revolution in the classroom (from mimeographs, scantrons, and filmstrips to floppy disks and CD-ROM, and finally to smart boards, Skype and Chromebooks), by the time I reached three decades as a full time classroom teacher, I was spending MORE time on my lessons and interacting with students, than less. Some tasks were indeed more efficient (for example, obtaining and sharing maps, artifacts, art, primary sources). Others, like collecting data about student performance for our superintendent, became arduous, weekend long affairs that sucked the life out of the joy of teaching. That said, I loved how Chromebooks and Smartboards freed up my instruction to empower students to do their own research and conduct substantive debates. For example, a simulation of the post WWI debates over the Treaty of Versailles from the perspectives of different countries – something I had done before Chromebooks – became a powerful lesson for students in the art of diplomacy, the value of historical perspective, and the grind of politics, as a result of THEIR OWN RESEARCH, not my selection of primary sources. This was MORE time consuming (2 weeks of instructional time, not 8 days) and LESS EFFICIENT, but MORE STUDENT CENTERED and COLLABORATIVE. Was it “better” instruction? Yes, if the point was for kids to experience “the art of negotiation”. No, if it meant having to drop a four day mini unit on elections in the Weimar Republic that I used to do after the WWI unit. Something is lost, and something is gained. Like you, I grapple with it’s a zero sum game. My question has always been what effect does the increase in classroom tech have on the students? Do they do better through out the years? How do we measure “better”? We have an AP History teacher who is very traditional. Kids listen to the lecture and copy the notes on the whiteboard. About the only tech he uses are some minor YouTube videos. His AP test results are outstanding. Would any tech improve on those results? At the middle school we have a teacher who uses a Smartboard extensively. It has changed how he does his math lectures. But he is still lecturing. Has the Smartboard improved student learning? I do not know. I have observed teachers that have gone full tech. Google Docs, 1-1, videos of lectures on line, reversed classroom, paperless. Their prep time increased. Student results seemed (just from my observation, I did not measure anything) to be the same as a non-tech classroom. It would be interesting to have two classrooms of the same subject at the same grade level, one high tech, one old-school and feed those students into the same classroom the next year. Ask that next year teacher if there is a measurable difference between the groups. Who is asking questions about the extent of access and use of technology by students and teachers and why? Who is not asking such questions, and why not? Is there a map of “daily classroom practices” for every subject and grade/or developmental level such that changes in these practices over time can be monitored with the same teachers in the same teaching assignments? Are there unintended consequences of widespread student access and teacher use of technologies other than “changes in daily classroom practices?” Here I am thinking about the risky business of assuming that change is not only inevitable but also positive(e.g., invigorates teaching and learning, makes everything moe “efficient”).